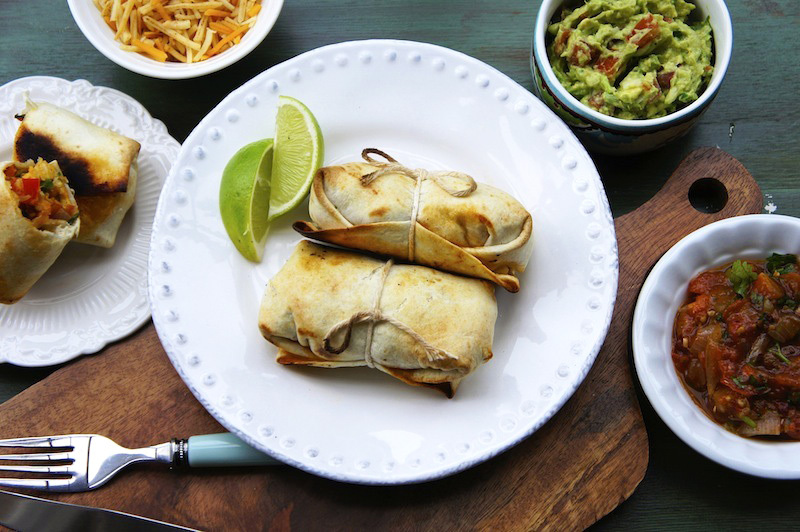 Chimichangas are deep-fried burritos. It's typically served with either salsa, guacamole, cheese, or sour cream. Here, I have opted to baked these Brunch Chimichangas instead of frying them. The soft tortillas will house the diced onion and pepper scrambled eggs, cheese, and roasted tomato salsa. Neatly wrap it all and brush with olive oil before baking in the oven until crispy on the outside. Serve with some fresh guacamole, it tastes fantastic! Melt butter in large non-stick skillet over medium heat. Add bell pepper and onion; cook 8 minutes or until softened, stirring occasionally. Beat eggs and salt together in small bowl; add to skillet. Cook eggs 3 minutes or until soft set, stirring occasionally. Remove from heat; cool 5 minutes. Stir in salsa, breaking eggs into chunks; stir in cheese. Spoon scants 1/2 cup egg mixture in center of each tortilla. Fold 2 sides of tortilla over filling; tuck in tortilla ends and place seam-side down in 13x9-inch baking dish coated with cooking spray. Brush tops of tortillas with olive oil. Bake in preheated 475°F oven 12 minutes or until golden brown. Serve with fresh guacamole.